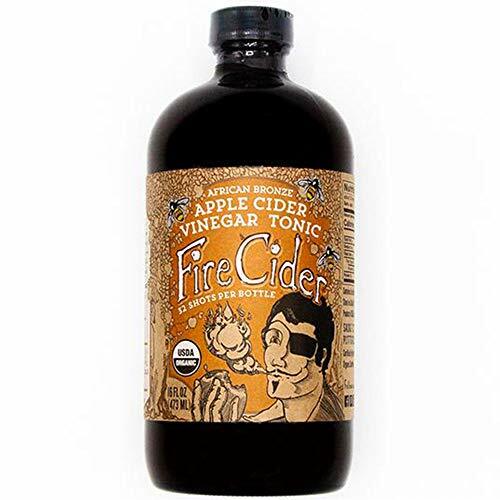 Made in New England: Fire Cider, Apple Cider Vinegar Tonic with African Bronze Honey & Dosage Shot Glass, Natural Detox & Cleansing, Pure & Raw, Certified Organic Ingredients, No Heat Processed, 16 Shots, 8 oz. Fire Cider, Apple Cider Vinegar Tonic with African Bronze Honey & Dosage Shot Glass, Natural Detox & Cleansing, Pure & Raw, Certified Organic Ingredients, No Heat Processed, 16 Shots, 8 oz. ORGANIC & ALL NATURAL: Our premium Apple Cider Vinegar Tonic is made with all natural Certified Organic vinegar, African Bronze Honey, fruits and vegetables.